Palnita, Art of the Ancient Americans (pen and ink, 2011) is an abstract drawing inspired by the inhabitants of North America, as they existed approximately twelve thousand years ago. The blues, greys and greens form a purposeful shape that evokes the original Americans’ way of life. The drawing’s outline of an arrowhead, axe, and pummel represents the basic tools for hunting, defense, and construction—the essentials for living. The intricate interior design of man reaching across open country symbolizes the peoples’ journey from the Bering land passage from Asia to the northwestern edge of North America, with outstretched fingers straining to find an allegorical coast of perpetuity that was just out of reach. 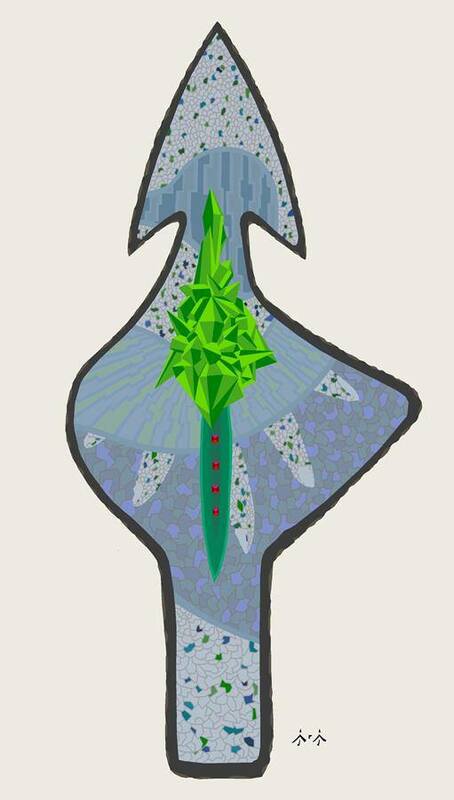 The sizable emerald formation at the heart of the drawing represents the land’s natural riches, while the obsidian dagger symbolizes the rituals and faiths of the thousands of tribes who inhabited the great continent.